" Austin got his first guitar for his 12th birthday in 2010 "
Austin got his first guitar for his 12th birthday in 2010. He dove into his new passion fingers first practicing for several hours every day. When asked who his earliest influences were, he lists; Jerry Cantrell, Kirk Hammett, Stevie Ray Vaughan, Joe Satriani, Slash, Steve Vai, Jimmy Page, and Dudley Taft. 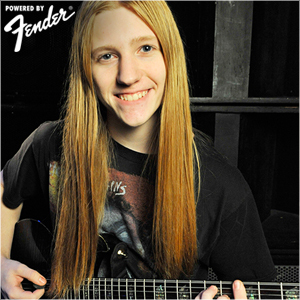 After a year of watching Austin’s continued dedication to the guitar, his Dad approached guitarist J.T. Phillips, a local guitar talent and instructor who is highly sought after in the Seattle music scene. J.T. soon began working with Austin, and under his guidance Austin’s playing really began to take shape. 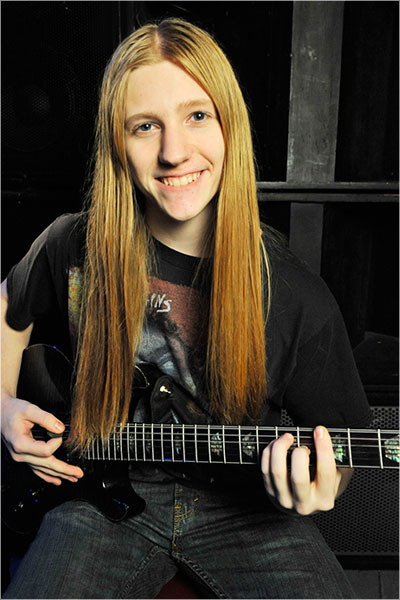 In August 2012, 14 year old Austin performed at his first Open Jam alongside bassist Lynn Sorensen (Paul Rodgers/Bad Co.) and drummer Doug McGrew (Foghat/Geoff Tate). Soon, Austin began playing at area blues jams hosted by guitarist Teri Wilson (Red Hot Blues Sisters / West Coast Women in Blues Revue). November 2012 Austin was asked to join the Seattle Metal band “Submerged in the Storm”. After several months and a handful of gigs the band went their separate ways. Two days after the break up, he received a call asking him to help with a new project to be titled “Bleed the Stone”. One month later they spent one day in the studio and recorded their original, “Claustrophobic” and a cover of Nine Inch Nails “Hurt”. In August 2013 at 15, Austin shared the stage twice with Rock & Roll Hall of Fame guitarist Roger Fisher (Heart) earning him a big smile, a pat on the back, and a “You played well!” from Roger. During early September 2013, Austin auditioned for, and was asked to join rocker Amanda Hardy as her lead guitarist. One week after his audition, they hit the stage opening for international touring act “Deap Vally”. Since then they have opened for Sick Puppies, Lacuna Coil, Cilver, Eyes Set to Kill, Jon Batiste, Chris Ballew, Anna Nalick, and many more. The band entered the studio in December 2013 and spent a week with Engineer/Producer Scotty Olson (Alice in Chains/Heart/Deftones). This resulted in their first EP “What’s Coming Your Way”. The 4 song CD was released in March of 2014. The band has since been playing out several times a month and they are constantly writing new material. Scotty has instilled in them that the best song they have ever written, is the one they haven’t written yet. Look for this hard working, hard driving young band to re-enter the studio in the Summer of 2014! When Austin first played through a Blackstar amp it was love at first note! Austin saved his money and soon bought a Blackstar HT100 head and a matching Blackstar 2×12” cabinet. Although he has several nice guitars, Austin’s new love is his Charvel DC-1 ST in transparent black. All of his electric guitars are strung with Ernie Ball Slinky Cobalt’s in .10-.52.